Today, June 22, is Bring Your Dog to Work Day! So, tell Fido what a good boy he is as he chills under your desk. And celebrate the day, because bringing your furry friend to work is certainly a nice perk. How important are pets in the workplace to pet parents overall? 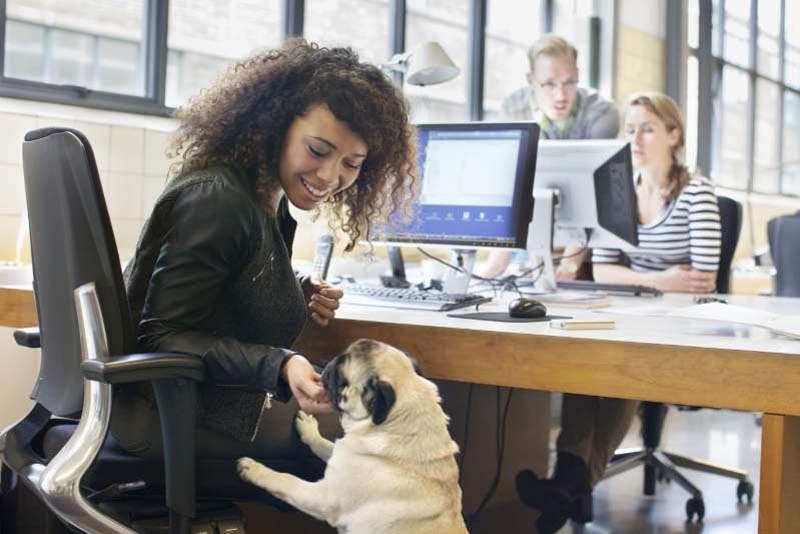 New research from Wellness Natural Pet Food answers that question, proving the power of a pet-friendly workplace when it comes to attracting and retaining employees. Specifically, of 1,100 pet owners, ages 18 to 65, whom a research company surveyed nationally, 51 percent said they would consider a career change for a pet-friendly workplace. And 37 percent of the pet parents polled said they would sacrifice benefits like vacation time or work from home days in order to enjoy a pet-friendly workplace. Of course, not everyone has to make sacrifices to bring their pooches to work. Some workplaces, like Harpoon Brewery and Zoosk, allow pets in the office year-round, saying that that move gives their employees more flexibility, improves their mood (and productivity!) in the office, and allows employees to bring their full attention to work. And the frosting on the cake, or the extra meat on the dog bone, is that those employees can also give their pets a level of companionship that the animals might otherwise not have during the workday. What's more, allowing pets in the office has human health benefits, too! Studies have found that pets can help lower our blood pressure, lessen anxiety and increase physical activity. First and foremost, ensure that your landlord or building management allows pets in the office. You should also check with your team to make sure everyone is on board, to avoid any surprises or upsets. Some people may have allergies, phobias or other concerns about dogs in the office, and you’ll want to give them an opportunity to weigh in. Whether your workplace consists of cubicles, private offices or an open layout, a plan for where pets will spend their time is essential. Ask yourself: Is there enough space near employees’ desks to accommodate a bed or crate? Do we have enough space to designate a special “pet area” sectioned off by doors, gates or other boundaries? And: Are there readily accessible outdoor areas for bathroom breaks? Should we require owners to "pick up" after their animals? The goal is to make pets and their owners as well as non-owners as comfortable as possible, and defining special boundaries can help accomplish this. You may also want to consider designating a pet-free section of the office for employees with allergies or a dislike or fear of dogs. Glassdoor, for instance, has found this kind of policy very helpful in its office. Begin drafting your pet policy. Now, you’re ready to begin drafting your pet-friendly office policy. Putting pen to paper helps formalize the policy and sets clear expectations for existing employees. Again, make sure to get input from both employees who will be bringing their dogs in and those who won’t, to ensure the policy is fair and balanced. Your policy should outline what types of pets are allowed in the office. It should detail how pets will be “interviewed” for acceptance (healthy and up to date on vaccinations, trained to some extent -- certainly housebroken -- and able to get along with other pets and people). Further, the policy should include how behavioral issues, damage to company equipment or non-compliance with the policy will be handled. Will pets be allowed in conference rooms and meetings? Are (annoying) squeaky toys a no-go? What supplies will your company provide and what should employees bring on their own? All things that should be included in your policy! You may also consider incorporating additional pet-centric benefits like “paw-ternity” leave -- Massachusetts-based Zogics, for example, gives new pet parents an extra week of paid time off to spend with their new family member! Just as we pet-proof our homes, your office will require similar planning to ensure safety for pets and pet parents alike. Loose wires should be secured, equipment and cleaning supplies should be placed out of any paw's reach; and you may want to invest in garbage bins with lids to avoid trash spills. If you’ll be designating certain spaces as off-limits, make sure that they are properly secured or blocked off. Pets in the office will also require some new office supplies, as well. If a pet has an accident (because even the best house-trained pups can get over-excited in a new space) carpet cleaner is essential, and baby gates or pens may also be necessary depending upon your office layout and policy. If you plan to designate an area specifically for pets, the way BissellHomecare does with its "pet spot," it may be helpful to outfit that space with items such as water bowls, beds, treats, toys, poop bags and spare leashes. Try stocking the office with grain-free, natural treats that most dogs do well on; that way, employees can treat their dog-office mates without the guilt less healthy or fattening snacks might prompt. Also, don’t forget some lint rollers for the fur that will soon be flying around! Plan for your furry new 'employee's' first day. All employees have a transition period when starting a new job, and a pet is no exception! Before implementing your pet policy, give your employees plenty of time to review the rules so everyone is on the same page. Keep in mind that transitions take time. Designating a portion of the morning, perhaps on a Friday, to welcoming pets to your workplace can help with this transition and give everyone the time needed to successfully integrate without interruption. Pets should be introduced to their new space and one other slowly, and if possible, in an outdoor area because some animals may become stressed or agitated meeting in an enclosed space. If you don’t have green space around your office, a patio space similar to that of pet-friendly O.H.S.O. Brewery is a great substitute! Owners should keep an eye out for signs of stress in their pet and plan to spend the rest of the day working from home if their dog does not take to the office. Whether you’re looking to build a business from the ground up, or seeking to grow your startup, having a pet along for the journey can not only help attract new employees, but also positively impact the work environment for those already on the team. Plenty of companies across the country have happily integrated pets into the workplace, proving that a pet-friendly workplace is one benefit worth serious consideration. You may be surprised at how dogs’ presence can translate into success for your business and a harmonious office environment for your employees. dearJulius.com: It's Bring Your Dog to Work Day! What You Need to Know to Make Your Office Pet-Friendly.